This evening, I opened the windows in my house and a gloriously crisp fall breeze blew right through into my kitchen. It's time for fall desserts. I can't wait for the leaves to turn colors. I love when the mountain is covered in the falling leaves. 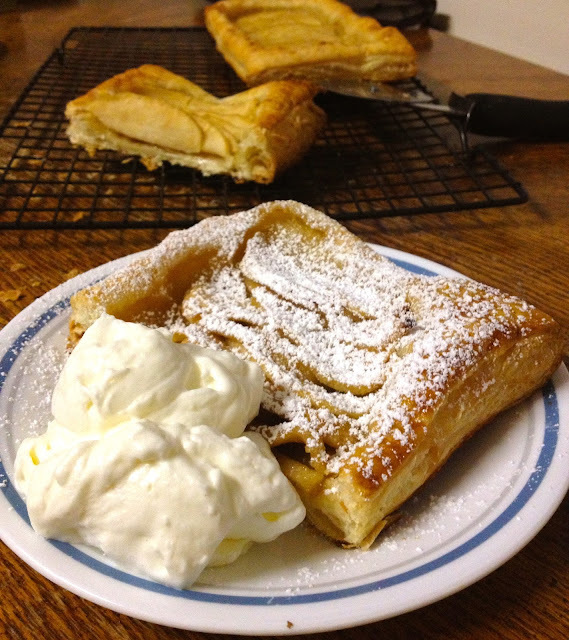 What better way to welcome autumn than by making an apple tart? 1. Thaw out puff pastry. It's best to let it sit in the fridge for 24 hours before using it, but if you forgot, just leave it out of the freezer for 30 minutes before trying to unfold it. 2. Preheat oven to 400 degreed fahrenheit. 3. Peel, core, and slice apples into very thin slices. Put the sliced apples in a bowl and top with brown sugar and a pinch of salt. Stir it around. Let it sit for 5 minutes. 4. Cut the puff pastry in half. Put it on a cookie sheet lined with silpat or parchment paper. 5. Arrange the apples on the puff pastry, leaving about 1" on the perimeter of the puff pastry so there will be a crust when it puffs up in the oven. 6. Bake for 18-20 minutes, or until golden brown. Sprinkle with powdered sugar and serve with creme fraiche.